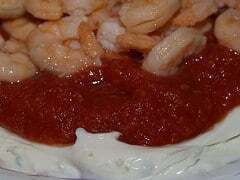 Home » Dips/Sauces » Easy Shrimp Dip – a quick and easy dip you can make in minutes. Easy Shrimp Dip – a quick and easy dip you can make in minutes. This is a quick and easy dip to make. Serve this with toasted bread or crackers. You may want to sprinkle scallions on top of this and serve at your next potluck dinner. Thanks to TraceyfromJersey for sharing her recipe. Easy Shrimp Dip - quick and easy dip you can make in minutes. You are going to love this shrimp dip! In a large bowl mix cream cheese with garlic salt. Spread mixture on a nice plate to form a large circle. Spread top with cocktail sauce, drained small shrimp, oregano and additional garlic salt. Serve with crackers!